Congrats to M.L.G! Melanie of The Pink Washingtoniette!. I've actually met Melanie and I know she is going to look so cute in this hat! 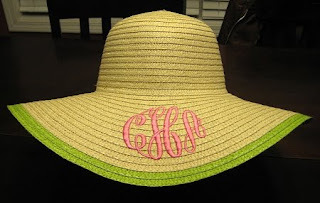 This Marley Lilly hat is perfect for any occasion (wear it to the beach, wear it to the Kentucky Derby, Easter Sunday, shopping, inside, outside WHEREVER!). The hat is available in 6 color trim options: pink, lime, brick, black, turquoise, and orange. Don't forget to check out the Marley Lilly website to see more adorable monogrammed gifts! Thank you so much, Kate! 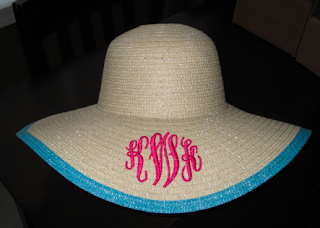 I'm so surprised and thrilled to win this wonderful hat giveaway! What an absolutely perfect Valentines Day surprise. I will wear it in stylish nautical honor of your fantastic blog. Happy Valentines Day to you and all your readers!